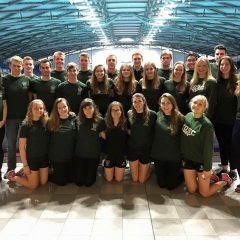 University of Exeter Swimming Club’s BUCS Squad had a successful weekend away at the BUCS Long Course 2014 Championship in Sheffield with outstanding swims across all events, and many previous club records broken. The Men’s 4 x 100m freestyle relay (Pete Lewis, Alex Winter, Nick Johnson, Dominic Woodbridge) made it into the B final and came 7th place with a new club record of 3.44.60. Likewise, the Woman’s 4 x 100m freestyle relay (Megan Wainwright, Cara Thompson, Lydia Smith, Seun Olusanya) came an impressive 4th place in the B final and broke a club record of 9 years with a time of 4.16.50; with Megan breaking the 100m freestyle club record in the process. There were many individual highlights over the weekend, including Dominic Woodbridge who came 12th in 100m fly in 58.39 breaking the club record by 0.51 seconds as well as 14th place in the 200m fly in 2.14.98 to break the previous club record by an incredible 12 seconds. Men’s Captain James Marshman swam an impressive 200m IM in 2.30.68, breaking the club record of 9 years. Nick Johnson came 17th overall in the 200m backstroke with a time of 2.17.63 and 16th in the 100 backstroke (1.02.16). Whilst Seun Olusanya came 24th in the 50m freestyle in 29.08, narrowly missing the club record by 0.04 seconds. Seun was able to build on her performance in the 100m freestyle, where she came 25th overall with a time of 1.04.68. Other superb performances came from: Christine Howie, Dan Crawford, Adele Marsullo, Sam Harvey, Rob Moran, Rachel Vaughan, and Phoebe Weaver. 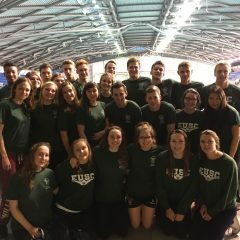 BUCS squad captain Adele Marsullo commended the teams performance by saying “Everyone swam remarkably well and they should all be very pleased that their hard work at training has paid off. The fact that multiple club records were broken is a testament to this. 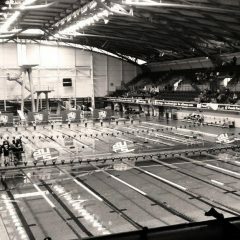 The teamwork shown in the relay teams was outstanding, and they did very well in the B finals”. Water you waiting for? BUCS report is here! 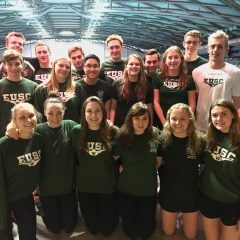 BUCS Short Course 2014 – Video Playlist.